OPCEA publishes an annual print Directory of member companies and the services and products they provide. The listings of suppliers, products, services, and advertising, make this Directory an important reference source for specifiers. As an OPCEA member, your listing is free. The OPCEA Directory will be distributed to some 8,500 key environmental professionals across Ontario, including those serving industries and municipalities. Readers include government officials, water and wastewater treatment plant operators, contractors, municipal engineers, technical support staff, industrial plant managers and engineers, and consulting engineers. Good directories have a long shelf-life as a reference source, so advertising in them is an excellent marketing opportunity. 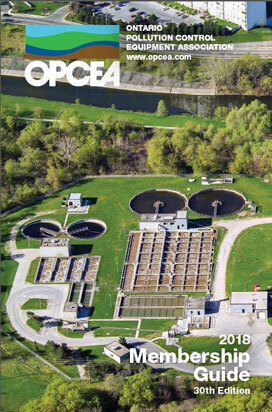 The OPCEA Directory will be distributed to some 8,500 key environmental professionals across Ontario, including those serving industries and municipalities. Reserve an ad in this directory and your company logo will run with your free listing, at no extra charge. Members will be sent an information package with details at the appropriate time. First published for distribution at the 1988 WEAO/OPCEA conference and tradeshow, OPCEA’s Membership Guide was the idea of Larry Madden of C&M Environmental and current WEAO Treasurer. The first edition profiled OPCEA’s 60+ members and was a mere 24 largely black and white pages in size. Since that time, the association has grown to over 170 members and the directory has followed suit. The 2018 edition is 84 full colour pages in size, and is “book bound” for added prestige and durability. 2018 marked the 30th edition of the OPCEA Membership Guide.